This Week's Bargains at Amazon! This is a great week to save big on historical and fantasy romance from Phaze Books. Look at what you can get on Kindle for $1.99 each! 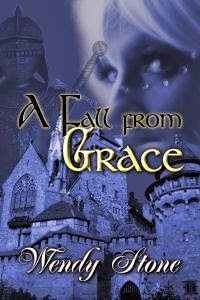 A Fall From Grace by Wendy Stone - Princess Alaina has two major problems; her castle has been overrun and her father has been killed. Now she is on the run with her personal guard, the man she's been in love with since he'd been presented - as belonging to her when she'd been sixteen summers old and finally allowed out of the school room. Could she keep her hands off of him as they raced to find a safe haven or would his love be the only thing to keep her from A Fall From Grace. A Familiar Tangle With Hell by Sapphire Phelan - Tina and Charun thought it was all over and that their life would be normal--well, as normal as it could be for an immortal Witch and her demon Familiar. Except there was another prophesy, one that laid claim that if Lucifer snatches Tina and mates with her before the last chime before midnight of the new year and gets her pregnant with his son, that the real Armageddon would begin, spelling the end of life as they knew it. A Fix in Time by Jade Falconer - As soon as time travel became possible, of course there were people who would abuse it for their own purposes. Luke Martin's job is to stop those people, and put the past back to rights. But what happens when he meets the man of his dreams in the past? In the middle of a plot to change the past in nineteenth century London, Luke meets Edwin and must decide between a love that could put them both in prison and the safety of the world. A Gamble Worth Taking by Wendy Stone - Forced into betrothal to relieve a gambling debt, beautiful Lara is reluctant to fall for Matthew Trent's charms. But as she succumbs to passion, darker otherworldly forces threaten their future. Is it worth risk to anger restless spirits? Warning: Contains scenes of severe violence. A Guide to Magical Cant by Shayne Carmichael - Forced from Mysteria University and his own home by a scheming father, Maer must make his way in a world he knows little about. Luck is on his side when he encounters an accounting wizard, Ethan, Ethan's wife, Princess Sophy, and a mage, Darius. However, Maer finds himself fighting an unexpected attraction to the mysterious mage. As they take on quests to battle bandits, help a demon prince, a sprite and a noggin, Maer becomes more and more fascinated by Darius. Too bad it's such a dangerous liaison in Aurora, and for the sake of both of their lives, Maer has no choice but to ignore his own feelings. Discounts on these titles happen through Saturday, September 12. Don't wait to save big!